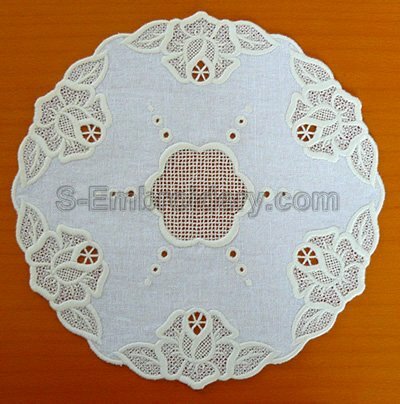 This machine embroidery design set combines freestanding lace and cutwork embroidery technique to create a nice doily with a diameter of approximately 10 inches (25 cm). 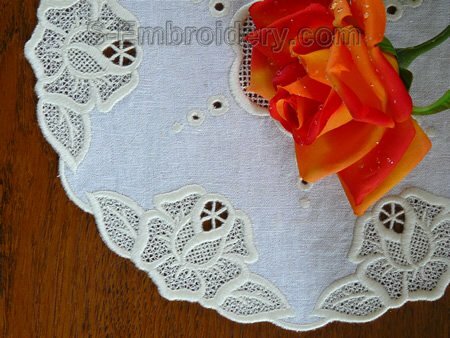 The set includes 4 machine embroidery files containing the components of the doily. This lace doily is created with an "assemble as you stitch" a.k.a "in the hoop" technique. It comes with instructions in PDF format. 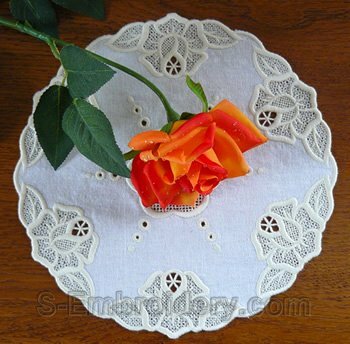 The procedures for creating the doily are generally similar to the ones shown in the Easter bunny freestanding lace window ornament tutorial. Important notes: In order to do this one properly and get good results the lace MUST be very well stabilized. So, you will need high quality water-soluble stabilizer. The Easter bunny featured on this page was created using thicker, fabric-like stabilizer and we would recommend using stabilizer of this type. In the process of creating the ornament you will also need adhesive spray or glue stick to attach pieces of stabilizer to each other. You will want to make sure that the glue you'll be using will be able to reliably stick together pieces of the stabilizer you have, that it will not damage the stabilizer and that the glue is water-soluble, so that it could be washed away. I just have to write and say how happy I am with your 10574 design. I was apprehensive to try what appeared to be a hard technique. Now, I love the + mark technique and wish I could figure out how to apply it to other designs. Nevertheless, I have finally learned to recognize a poor, good, better, and excellent digitized design. There are only a few truly excellent designer/digitizers. Stacy, your designs are "Blue Ribbon" exquisite. The reinforcement stitching is plentiful, the satin stitching has no gaps, etc. In short, the stitch-out is perfect! You are a perfectionist and it shows. Your ability is a gift. Thank you for sharing it.